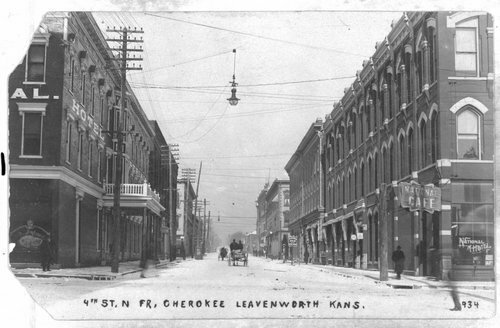 This black and white photograph shows Fourth Street looking north from Cherokee Street in Leavenworth, Kansas. In the background a wagon can be seen traveling down the snow covered street, as pedestrians walk along the sidewalks. To the right, a sign is visible for the National Hotel and National Café.